Four Forest provides an outstanding value in the Class A space compared to other properties in the Central Expressway submarket. On-site amenities include a fitness center, full-service bank, Shoe shine service, full-service deli, high-speed Internet and cable access and convenient sundry shop. The location provides close proximity to shopping, restaurants, hotels, and the hospital district. The 398,767 square foot office building rises 19 stories. The Class A office space offers a typical floor plate of 21,400 square feet. With a 3 per 1,000 square foot parking ratio, on-site security is provided for 24/7 ease of access. Four Forest Plaza is conveniently accessed by Central Expressway (US-75) and LBJ Freeway (I-635) and is located within 10 minutes of the Dallas Central Business District. 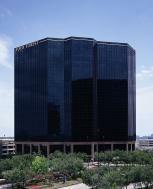 Four Forest Plaza is located within 30 minutes of Dallas/Fort Worth International Airport (D/FW), the third busiest airport in the world and within five miles of Love Field, the home of Southwest Airlines. It is located on the west side of North Central Expressway (US 75) between Forest Lane and Interstate 635 in Dallas, Texas.